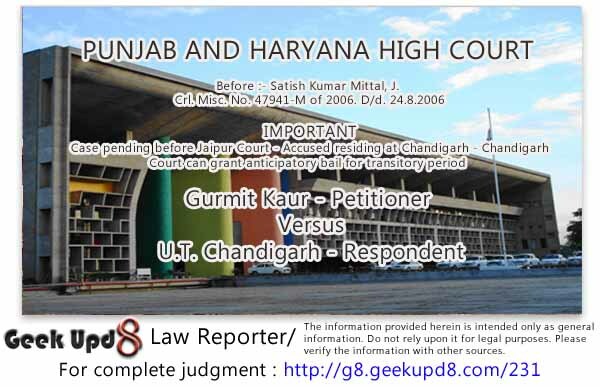 PUNJAB AND HARYANA HIGH COURT Before :- Satish Kumar Mittal, J. IMPORTANT Case pending before Jaipur Court - Accused residing at Chandigarh - Chandigarh Court can grant anticipatory bail for transitory period. For the Petitioner :- Mr. Amar Vivek, Advocate. For the Respondent :- Mr R.S. Rai, Sr. Standing Counsel. Mahesh Kumar Sarda alias Maheswari v. Union of India, 2000(4) RCR(Criminal) 129. Capt. Satish Kumar Sharma v. Delhi Administration, 1991 Criminal Law Journal 950(1). Satish Kumar Mittal, J. - Petitioner Gurmit Kaur, apprehending her arrest in pursuance of non-bailable warrant issued by the Court of Additional Metropolitan Judicial Magistrate, Court No. 23, Jaipur, City Jaipur, in complaint No. 192 of 2005 under Section 138 of the Negotiable Instruments Act (hereinafter referred to as 'the Act'), titled ICICI Bank v. Gurmit Kaur, has filed this petition for bail under Section 438 of the Code of Criminal Procedure for transitional period, so that she can appear before the concerned Court and seek her remedy there. 2. Petitioner, who is 68 years old widow, is residing in Sector 29, Chandigarh. In the petition, it has been stated that when her husband was seriously sick, she raised a personal loan of Rs. one lac from ICICI Bank, Chandigarh, for setting up a small stitching business. Out of the said loan, she had already returned a sum of Rs. 35,000/- to Rs. 40,000/- to the bank. However, due to the death of her husband, she defaulted in payment of a few instalments. On the basis of the cheque issued by the petitioner, the ICICI Bank filed a complaint under Section 138 of the Act at Jaipur, though no transaction took place at Jaipur and the Court at Jaipur has no jurisdiction in the matter. It has been further stated that in the said complaint, the petitioner did not receive any notice or summon of the Court. However, few days back, some police persons from Police Station Sector 17, Chandigarh visited her house and informed her relations that they had come to arrest the petitioner, as she has been summoned by non-bailable warrants in the aforesaid complaint. 3. I have heard the arguments of learned counsel for the parties. 4. Counsel for the petitioner while relying upon a Full Bench judgment of the Calcutta High Court in Mahesh Kumar Sarda alias Maheswari v. Union of India, 2000(4) RCR(Criminal) 129 and a Division Bench judgment of the Delhi High Court in Capt. Satish Kumar Sharma v. Delhi Administration and others, 1991 Criminal Law Journal 950(1) has submitted that keeping in view the facts and circumstances of a case, the High Court can entertain an application for grant of anticipatory bail for transitional period in respect of an offence committed outside its jurisdiction, if the applicant is going to be arrested in its jurisdiction. 5. In the aforesaid judgments, it has been held that the High Court or the Court of Session, after taking into consideration the material placed before it, can grant anticipatory bail to an accused for transitional period for appearance before the court concerned and seek his remedy there. In Capt. Satish Kumar Sharma v. Delhi Administration and others (supra), it has been held that the High Court or the Court of Session within whose territorial jurisdiction the person has a reasonable apprehension that he would be arrested shall have concurrent jurisdiction to grant anticipatory bail for a limited period. 6. Keeping in view the facts and circumstances of the case and the nature of the offence alleged to have been committed by the petitioner, which is bailable, the petitioner is granted anticipatory bail for a period of 21 days, so that she may appear before the Court concerned at Jaipur and seek her appropriate remedy thre. During this period of 21 days, in the event of arrest, the petitioner will be released on bail on her furnishing personal bond in the sum of Rs. 50,000/- to the person effecting her arrest for her appearance before the concerned Court. After the personal bond is furnished by the petitioner, as directed, the same shall be sent thereafter to the Court of Additional Metropolitan Judicial Magistrate, Court No. 23, Jaipur, City Jaipur.